So professionally done and helpful! Love that you can view offline and take to the barn to make sure you're doing it all right. This is a big help to keep our good friends feeling good. And the lessons are understandable so you can go do the work right away. Extremely simple and easy to use! 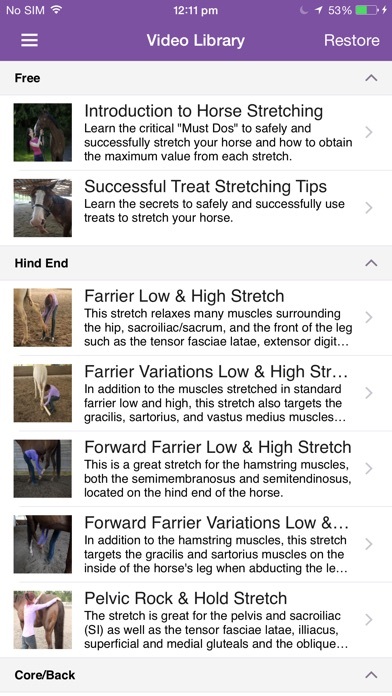 Best horse stretching guide in the App Store! This is the most comprehensive guide I have seen, all in one place. This app saves time and money while giving me everything I need to do the stretches right. Win win! This app is so helpful! 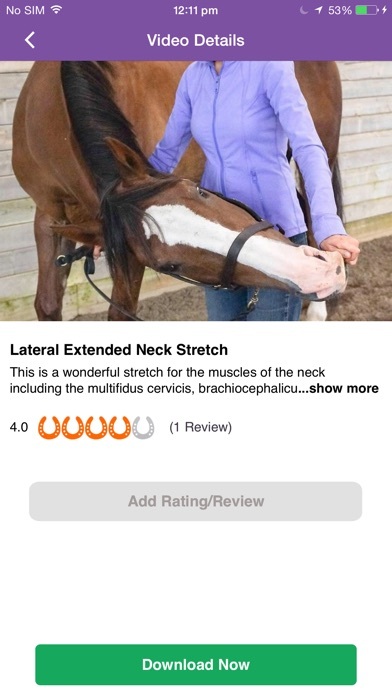 I recommend this app to everyone who owns a horse and wants them to be supple and to help with sore muscles. I am a dressage trainer and I highly recommend this app! It's so great that I can review the videos at the barn and not need a WiFi connection. I have been consistently stretching my horses and it is amazing their change in suppleness and flexibility. I feel like my horses stay soft in their body with these stretches, and it's another great way to spend time with your horse out of the saddle. 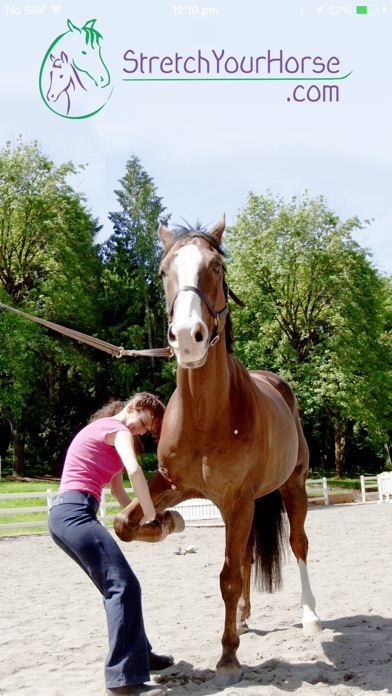 Stretch your horse! As a saddle designer, often I see horses that will benefit from stretching. Like any athlete stretching before working prevents injury and helps build muscle. At 2.99 for the first 3 apps and only a few dollars for each additional app they are a great value. By the way to those commentators who said they thought the entire set of 20 apps was 2.99: I am guessing you were probably sidetracked or interrupted when buying the app. As it says clearly the first 3 are 2.99 and the rest are sold separately. DON'T PURCHASE! Once you pay for the app you have to pay for the other instructional videos! I want my $ back. A rip off! I am incredibly disappointed to find out, after purchasing the app, that almost all the videos have to be paid for! I thought more videos would be included for he price, but you have to pay for everything additionally. What is the point of charging for an app if you still have to pay to use it?? I'm also disappointed that the only option to view the videos is to download them. I get that this is a great feature for bad service, but it would be really nice to have an option to view them online to save space on your phone. Overall I am super dissatisfied with this purchase. This app is unable to refunded so if you are on the fence, I do NOT recommend it. Spinning wheel round and round we go. I bought one stretch video and now when I got to the library the whole app locks up and is non-responsive. I just have a continuous spinning circle to look at. I tried closing and reopening and deleting and reinstalling to no avail. Pretty useless at this point. This is a very helpful app. I love being able to access the videos offline.